Ever get that astonished feeling that some of the simplest things come as a complete surprise? When a friend of mine offered to give me some pawpaws from her tree last fall, I hesitated; what is a pawpaw? “Haven’t you heard the children’s song ‘pickin’ up pawpaws; put em in a basket? '” my friend asked. I thought about it, but couldn’t conjure up anything more than a faint familiarity with the rhyme. Let’s just say that the conversation ended up with a delivery of a few pawpaws for me to try. 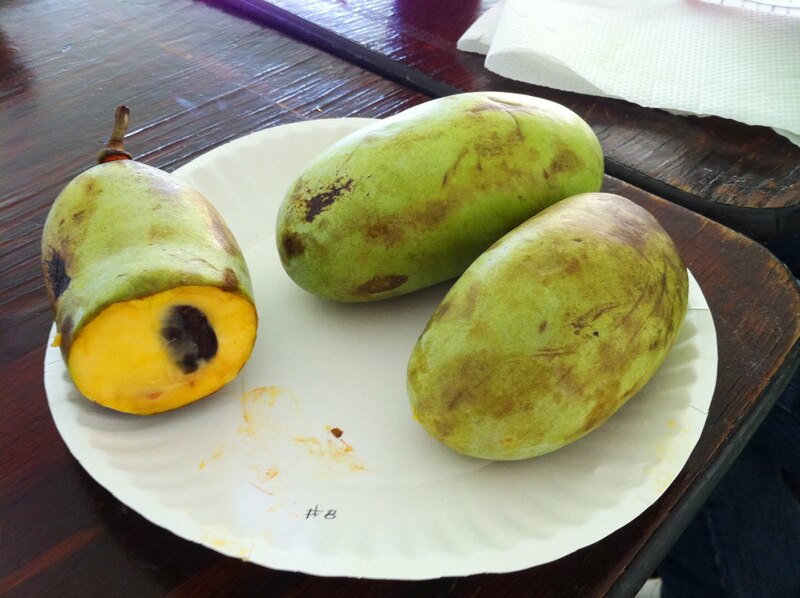 The verdict was almost instantaneous–pawpaws are delicious! The fruit is about the size of a pear with a thin skin. The inside is a soft fruit with a texture similar to a mango or kiwi, almost pureed. The seeds are quite large, almond-size. Cut open a supple pawpaw and start eating it with a spoon! It tastes like an expensive smoothy. Needless to say, my friend received instant feedback regarding her delectable fruit. This week, she called me over to her house to pick up seeds, along with an article from 1986 by Tom Mansell. The article states that pawpaws have “…been rated by worldwide connoisseurs as one of the six most delicious fruits in the world (the others are durian, mangosteen, sweet sop, Oriental persimmon, and chermoya).” Well, I’ve heard of durian at least! My next project will be to try to cultivate my own pawpaw trees from seed, which is apparently tricky due to the long tap root. I eagerly await the sixth-year harvest and can imagine myself telling friends about how my friend Carm gave me seeds way back in 2014. Ahhhh….the future memories!